As federal climate policy players clear the court, California Gov. Jerry Brown (D) is attempting a bank shot. Brown is in China this week to promote action on climate change and clean energy. It's a trip he has made before under previous presidents. But this time, he comes as the United States' pre-eminent emissary on climate change. Amid the climate policy void left in President Trump's wake after his announcement last week of the United States' withdrawal from the world's first truly global climate change agreement, Brown sees China as the remaining superpower that can steer the world onto a low-emissions path. "America was a leader with China, and now America's gone AWOL under Trump, and China's the leader," he said in an interview with E&E News last week. "China's the hope, and that's why I'm going to China to work with them on a sensible climate change strategy." China is at a pivotal moment in its climate policy, and California has the clout to exert leverage. As the world's largest carbon emitter, China poses a prime opportunity for California policymakers to extend the reach of their pioneering climate work, which they are quick to concede covers only 1 percent of global greenhouse gases. China has a goal of reducing its carbon intensity by 40 to 45 percent from 2005 levels by 2020, and it has made significant strides toward renewable energy and other policies to reduce its emissions, most notably including plans for a nationwide carbon market. Brown's previous meetings with Chinese officials, bolstered by the work of state agencies and California-based think tanks, have helped usher in a set of fledgling regional carbon markets that have the potential to go national later this year. This visit could nudge China over the edge into a program that, while not based on absolute emissions reductions, could bring other countries into the climate fold. "They are leaving the starting gate in terms of those policies, and there's a lot of momentum," said Jeremy Schreifels, a visiting fellow at Resources for the Future. "There's really a lot riding on the success of the program. If China's CO2 trading program is perceived as a successful program, I think it could provide the other nations the confidence to adopt the emissions trading model and take on a climate commitment or a more stringent climate commitment." Brown began working with China soon after beginning his third gubernatorial term in 2011, as his interest in climate dovetailed with China's and former President Obama's. Brown met with Chinese President Xi Jinping in 2012, 2013 and 2015, and signed an agreement with China's National Development and Reform Commission (NDRC) to work on energy efficiency, emissions trading and other climate policies. After Chinese politicians got over their wariness of the United States' motivations for trying to get them to curb their emissions, climate proved a rare safe harbor for discussion. "It was the one area where the two countries actually came to kind of agree with very little dissent," said Orville Schell, a longtime scholar of both China and Brown and director of the Asia Society's Center on U.S.-China Relations. "They were fighting in the South China Sea, Tibet, the East China Sea, human rights, trade was a terrible obstacle course. When it came to climate change, this was the keystone of the U.S.-China collaborative arch. And then Trump pulled it out." In the vacuum of federal inaction, Brown's role has grown commensurately. "He's actually laid the groundwork in a way that positions him very nicely now," Schell said. "I think he'll see Xi Jinping when he goes. We'll see this thing growing and expanding in exactly the way that many of us had hoped it would. It's not all roses for America, because California is not America. And we still need an American policy. It's a surrogate of a smaller kind. It's something." Observers are quick to note that Californian institutions carry significant cultural cachet in China. "People in China might like or dislike the United States, but they all love California," said Hal Harvey, CEO of the San Francisco think tank Energy Innovation, which has worked closely with Chinese policymakers. "California has infinite soft power. Chinese officials are keen to learn about everything here from the Silicon Valley to Hollywood to clean energy technology." Brown, in his 15th nonconsecutive year as governor of California, is similarly popular. "He's legendary," said Junjie Zhang, director of the Environmental Research Center at Duke Kunshan University, a joint venture of Duke University and Wuhan University. "When he talks, people will listen." California climate experts, in turn, praise Chinese national politicians such as Premier Li Keqiang and Xie Zhenhua, vice minister in charge of energy and climate at the NDRC, who criticized Trump's vow to exit the Paris Agreement just before the election in November. Xie's remarks and China's actions thus far indicate policymakers are willing to shoulder the economic dislocations that may occur from climate policies, as well as efforts to reduce the country's glut of industrial overcapacity. Officials announced last year that they would cut 1.8 million steel and coal jobs, or about 15 percent of the workforce, a move aimed at stimulating service-sector growth. "That takes foresight and political courage," Harvey said. "The private sector in the U.S. is doing the same, but our public policy in energy is instead using more of a Soviet-style protectionism to try to keep obsolete businesses alive. The irony is breathtaking." On the regional level, though, officials are more conflicted. Their pilot carbon markets, and the details that have been released so far on the national plan, disappoint observers who say the Chinese should be tougher on coal-fired power plants relative to other resources and should be more transparent and consistent in how they allocate carbon allowances. "Since the diplomatic value of climate change between China and the U.S. disappears, China is also getting less enthusiastic on climatic issues," Zhang said. "At this critical stage, whether or not climate actions will further complicate Chinese economic growth is something China is seeking evidence from other regions, other countries." Experts are hoping Brown's role, and that of his air pollution chief, Mary Nichols, will be to stress the economic benefits of climate action and the value of rigorous regulations. "If they say those things six ways from Sunday, they will be lionized and they will make a difference," Harvey said. 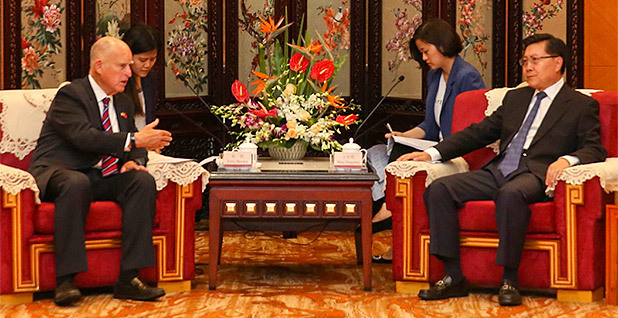 Brown began his trip in Chengdu on Sunday by meeting with the party secretary of Sichuan province, Wang Dongming, before heading to Nanjing, in Jiangsu province. He told Wang that China's role is more important than ever under Trump. "The key to Paris was President Xi and President Obama meeting together," he said. "Now, with President Obama gone, it's up to President Xi to advance the ball, and we need to stand behind him and make that possible." Brown also cited energy storage as an example of an industry that benefited from government stimulation. California ordered its large utilities in 2013 to procure 1.3 gigawatts of storage by 2020. "All the companies said no and opposed it," he said. "Now the companies are investing and making money." Brown heads to Beijing tomorrow to host a meeting of states, provinces and nations committed to voluntary greenhouse gas targets of under 2 tons per capita by 2050. That group, the Under2 Coalition, has been steadily expanding since Brown started it in 2015 and now includes 170 jurisdictions encompassing about 1.18 billion people. The meeting will take place alongside a clean energy conference that was the brainchild of former Energy Secretary Steven Chu, and that current Energy Secretary Rick Perry is scheduled to attend. Brown played a significant role at the last Clean Energy Ministerial, in San Francisco, but this time, he will focus more on his Under2 group. In California, Brown is in the middle of negotiations over the state's own cap-and-trade system, which lawmakers and interest groups are tugging at to produce steadier revenues. He had originally wanted to reach a deal by mid-June, but instead he is focusing on China. "Hopefully, he is convincing, right?" said Zhang. "Hopefully, he can convince China that although the federal level is reluctant at this time, at the subnational level California's commitment still does not change."